Geometric, Repositionable, Two-Side Writable Tabs, 2" x 1½"
UltraTabs Multi-Use are durable, repositionable tabs that make indexing, marking and referencing documents quick and easy. The tabs are writeable on both sides and the adhesive bodies are clear so you can see text underneath. Great for organizing, indexing and marking books and more. UltraTabs Multi-Use are durable, repositionable tabs that make indexing, marking and referencing documents quick and easy. The tabs are ultra-writeable on both sides and the adhesive bodies are clear so you can see text underneath. You can write on the tabs and bodies with most pens, pencils, markers and highlighters, and they're smudge free. * The Multi-Use tabs are ultra-versatile and great for organizing everything from documents, files, notebooks and more. They're also ultra-removable and stick securely but remove easily. Perfect for home, office and school. Easily write on the see-through writeable body or the two-sided, paper-covered tabs. Works with most pens, pencils, markers, highlighters and no smudging once the ink has dried! Tabs’ self-adhesive sticks securely and removes easily, but hold strong enough to turn pages. Sturdy, writable and repositionable tabs makes marking, indexing, referencing and separating pages neat and easy. 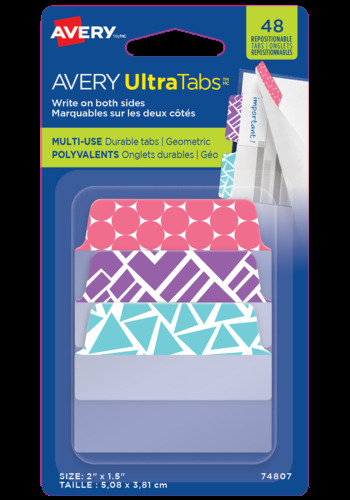 Avery UltraTabs™ Multi-Use 2" x 1½"